Are you looking for a rubber bellow manufacturer? ERIKS can offer you one of their numerous bellows out of stock or we can produce a custom made bellow for you! ERIKS is a rubber bellow manufacturer with years of experience. Do clients recommend ERIKS as rubber bellow manufacturer? Yes, they do. ERIKS is stated as a good and experienced rubber bellow manufacturer. At ERIKS the customer always comes first. We constantly meet and even exceed our customers expectations by involving them in the process as much as we can. Why should I use rubber bellows? Removes vibration between equipment such as engines, water pumps, condensers etcetera. I will compensate small installation misalignments. 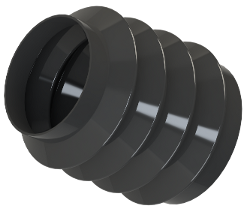 Rubber bellows are often used to seal dust, sand and other environmental elements from moving parts of machines. Which rubber bellow do I need? If you are not sure which rubber bellow you need for your type of machinery, you can check our bellow selector. Our bellow selector makes sure that you choose the right one. Most of the bellows are in stock at all times. If making a prototype is necessary, ERIKS will create one and test it in practice. Just contact one of our ERIKS locations in your area. Having some doubt or questions? When you have doubts about which bellow is the best solution or you have some questions about our products, feel free to contact us at any time.